FULLY FURNISHED WATERFRONT CONDO AT YACHT AND TENNIS CLUB ON ST PETE BEACH! See attached video! Island and gorgeous water views from this lovely move-in-ready 2 bedroom, 2 bath condo. Neutral decor and excellent condition, this fine condo is turn key. Updated kitchen with white appliance and cabinetry and tumbled tile back splash; table in kitchen to enjoy the island and beach view to the south. 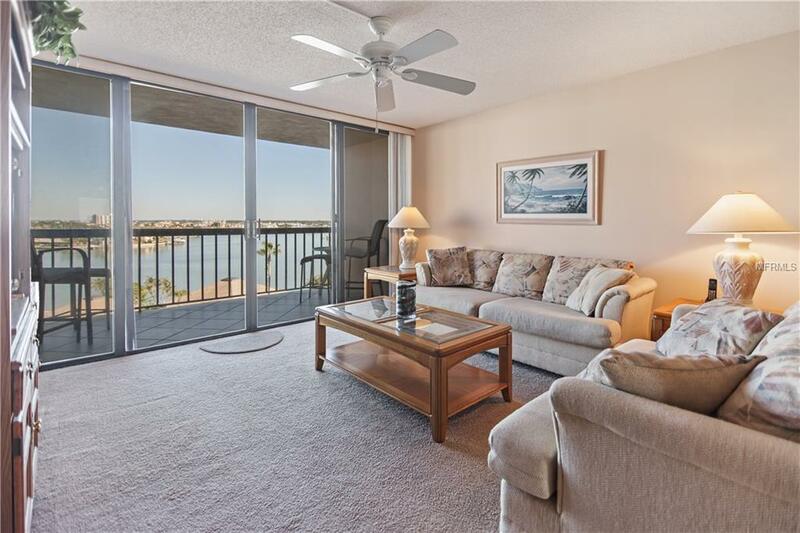 Spacious living room with tile flooring leads to large balcony with exceptional water views! Washer and dryer in unit, new carpeting in master suite. Updated master bath is sure to please. Access from master bedroom to waterfront with a breathtaking view. Beautifully maintained Yacht & Tennis Club is a 1st class gated community with wonderful amenities: marina with boat slips available for sale or lease, 7 Har Tru Tennis Courts, 24 hour security, tennis pro on staff during winter and spring months, renovated fitness center with group fitness classes in high season, waterfront Olympic size heated pool, whirlpool, barbecue deck and gazebo dining area, plus men's & women's saunas. The clubhouse has WIFI, a party room, card rooms, billiards and is available for your functions. Near beach, restaurants and live entertainment! Great price!